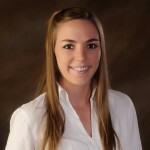 Mallory Gabro, P.E., has joined the San Patricio Municipal Water District team as staff engineer. Since becoming part of the Water District team in August she has been acquainting herself with the water supply system and projects already in various stages of planning. Initially her job will be to oversee construction of expansion projects being initiated to address water demand growth from industrial customers. This includes pipeline projects and additional capacity in the Plant C microfiltration facility. After several years in the works plans for a new District operations center are also moving forward. Ms. Gabro is a 2009 graduate of Texas A&M University with a degree in civil engineering. Since 2010 she has been an engineer in training and a project engineer with a South Texas engineering firm working for various clients on water distribution, water modeling, water plant and booster pump station design. She also has project management experience in major wastewater collection system rehabilitation. She is a member of the Texas Society of Professional Engineers, the American Society of Civil Engineers, the South Texas Environmental Professionals, Young Business Professionals of the Coastal Bend, the Nueces County A&M Club and the Water Environmental Association of Texas. Ms. Gabro grew up in the area and played volleyball, softball and basketball at Gregory-Portland High School.